Etsy offers an online platform for makers of handmade products and crafts to market and sell their goods to a vast network of buyers who demand unique, genuine products. To date, the site has attracted over 400,000 sellers who collectively have sold over 30 million items, generating more than $180.6 million in revenue. Back in the olden days - you know, circa 2004 or so - artists and craftspeople had to drag their portfolio and wares to galleries and craft shows, and popularity in the local market didn't mean an end to your day job. But thanks to Etsy, a website that connects makers of handmade products and crafts with buyers, those same artisans can now market and sell their goods to a worldwide network of motivated shoppers. 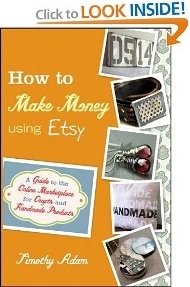 Etsy.com is the newest tool of the arts and crafts trade, and How to Make Money Using Etsy is your instruction manual. To date, the site has attracted over 400,000 sellers who collectively have sold over30 million items, generating more than $180.6 million in revenue.